Maria Leijerstam just landed at a Russian base in Antarctica. 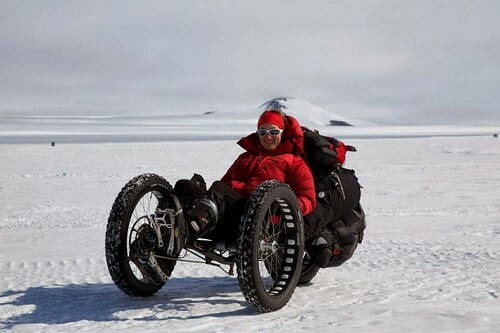 She is in seriously good shape, and she plans to pedal a trike to the South Pole. Racing over 400 miles from the edge of the continent toward the middle, 35 year-old Maria hopes to beat two other male contenders to claim the world record. She will face temperatures as low as -35°C and wind speeds up to 50 miles per hour. She will have to overcome dangerous obstacles such as crevasses, shifting ice shelves, glaciers and snowstorms. 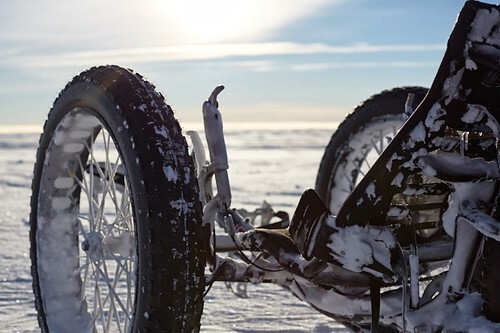 This challenge has been attempted before by riders on standard winter bikes known as Fat Bikes, but none have yet succeeded. She had a trike specially made in the UK by a company that could not have come along with a better name or pedigree — ICE Trikes. Maria’s preparation has included training and equipment testing in Siberia, Norway and Iceland. 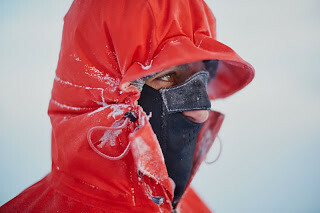 To replicate the severe cold of Antarctica she has endured a day cycling in an industrial freezer – much to the surprise of factory workers who continued to stack shelves with frozen food. Maria has identified a route to the South Pole virtually untested by polar explorers. She will start her bid for the world record by climbing the Leverett Glacier before heading due south for the South Pole some 400 miles ahead. We can’t claim any connection with this extraordinary adventure, but my wife recently took delivery of a machine that bears some resemblance to the beast Maria will be riding. It is a model called a Gekko, from a German company called HP Velotechnik. I wrote about our ride in this blog during our visit to The Netherlands last year. When you reach a certain age, major purchases happen at something less than warp speed, but they still happen, eventually. You may be wondering why we didn’t avail ourselves of the local products. Greenspeed is based here and it is one of the most successful trike manufacturers in the world. 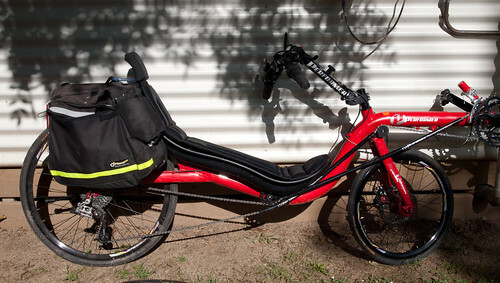 Trisled and MR Recumbents both make fine machines in the Melbourne area. I think it is simply a matter of chance. She happened to ride a Gekko and found it fit her and felt just right. For those of you who are unfamiliar with three-wheel machines, they come in two varieties– tadpoles (2 wheels in front) and deltas (one wheel in front). Most of the trikes sold are tadpoles. They are low and feel fast because you are so low to the ground. They take some getting used to, especially on fast, tight corners. 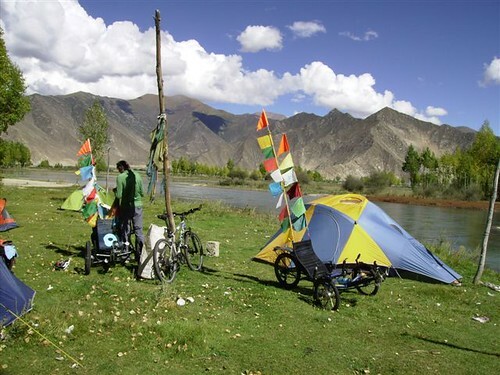 When we arrived here seven years ago, many of the recumbent cyclists I came to know made their own bikes. 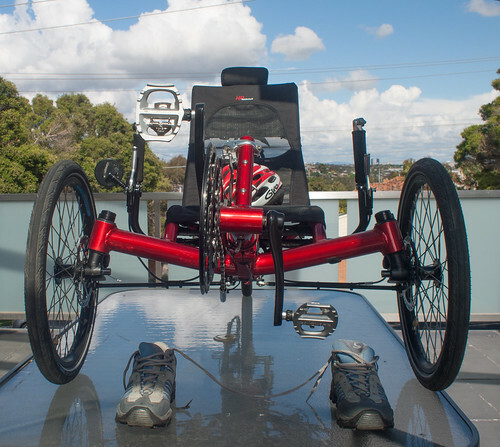 Alan Ball came up with an ingenious design for a folding trike which he patented. It will soon be on the market in the USA, manufactured by a company called Edge under the name E2. 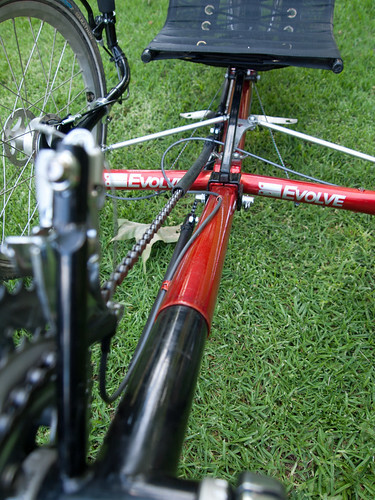 Trikes are a small but growing part of the cycling market. They sell well in the the Southern part of the USA, where retirees are looking for exercise but loathe to put up with the aches and pains caused by diamond frame bicycles. 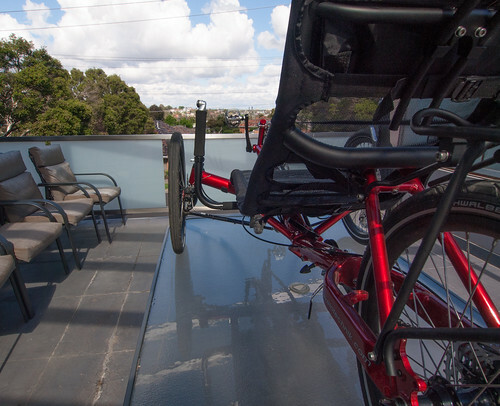 Many people assume that if you ride a trike you are handicapped in some way, and that may well be the trigger that puts people on a recumbent in the first place. Others, like me, are just early adopters. Trikes are ideal for touring, where aches and pains are a serious hindrance and distance is far more important than speed. A few years ago, Gordon Cohen fell off a roof. His weight ballooned and he could not exercise. He liked to ride his bike and go to the gym regularly. The damage to his body was serious. It took a trike to get him back into an exercise regime he could live with. Now, he has his own trike shop and represents ICE, among other brands, in Brevard County, Florida. He just completed his first recumbent show at the Boomer and Sr.’s Expo in Melbourne, Florida. Just a hop, skip and a giant jump from Melbourne, Australia. Here’s to Maria! There’s adventure left in these bones and trikes are looking better every day. 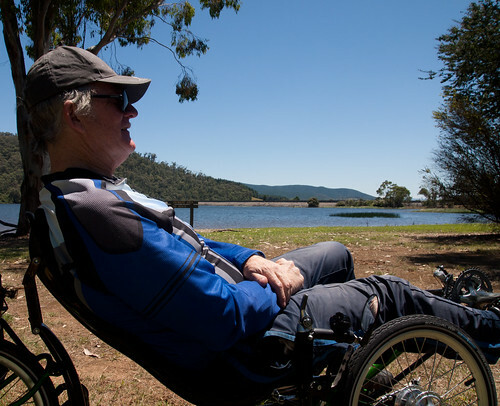 There are two or three reasons people take up recumbent cycling. The first two are flip sides of the same reason– 1.) to eliminate the aches and pains that accumulate from riding diamond-frame bikes, and 2.) to cycle comfortably in something like a chair, looking straight ahead rather than at the ground; and 3.) to go very fast. Most cyclists regard recumbent riders with disdain, figuring, sometimes correctly, that we have come to the world of reclining bicycles because of a bad back or because we are handicapped in some way. When people think of speed, they probably picture the kinds of bicycles they see in time trials or during the big races like the Tour de France. But those are not the self-propelled machines that go really fast. The only way to go fast is to cut wind resistance and that means getting prone or behind another vehicle. When legs and lungs are equal or close to it, wind resistance makes all the difference. Last December I invited myself along to the annual meeting of the OZ Human Powered Vehicles group here in Eastern Australia. It was held in Myrtleford, one of my favourite little towns in Victoria, up in Alpine Country. It is fine cycling country because the train that used to run from Wangaratta to Bright has been replaced with a bike path. 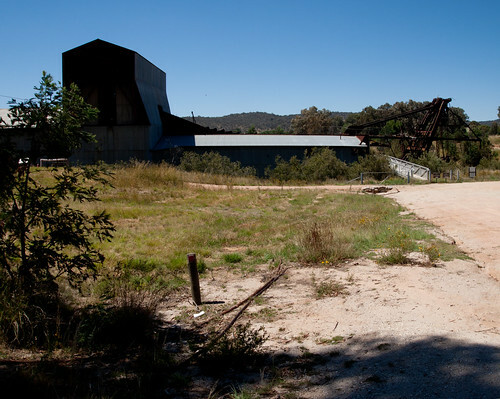 There is a short, but challenging spur trail up to the old, gold town of Beechworth. Most of the rail-trail is pleasant and parts of it are lovely. Myrtleford is in the middle, an ideal place for a meet-up of people coming from all over, but mostly from Melbourne and Canberra. 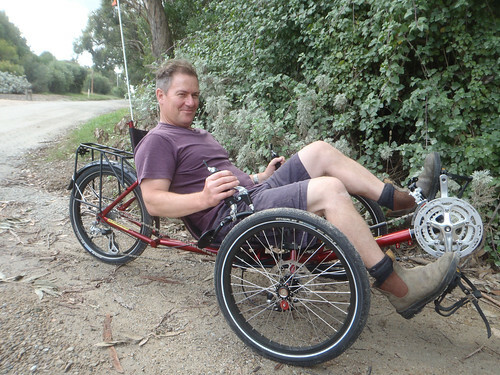 The OZHPV group attracts all sorts, from ingenious tinkerers who build their own bikes, to laid-back, comfort-loving riders who ride recumbents for the sheer fun of it. Then there are those who are serious about speed and stamina, cyclists who have circumnavigated Australia without getting much sleep. It seems like the serious ones came from the capitol, Canberra. Too much testosterone, I imagine. I have seen the same thing in Washington DC and even in Ottawa, Canada. Type A people either love politics or the perks of the civil service. The annual meeting was long and noisy and consensus was hard to come by following an unsatisfactory dinner. I decided to skip it and settle down with a good mystery in my bunk bed. I had come for the rides and the opportunity to catch up with some of my recumbent buddies, not wrangling over how to collect more dues or spend the modest sums the group managed to collect. 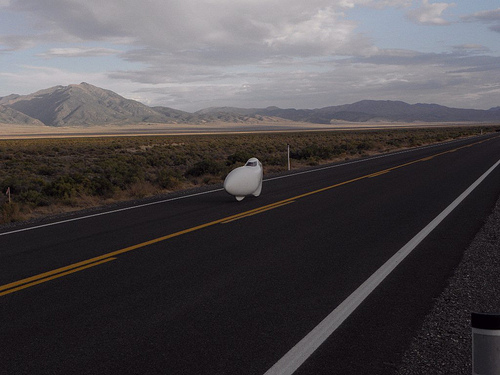 It is a long way from Australia to Nevada, but that is where the real action is in terms of setting speed records. Every year, phenomenal riders from all over the world head for Battle Mountain, where they compete with one another over a four mile stretch of perfectly flat road. The current male record holder is a Canadian by the name of Sam Wittingham. 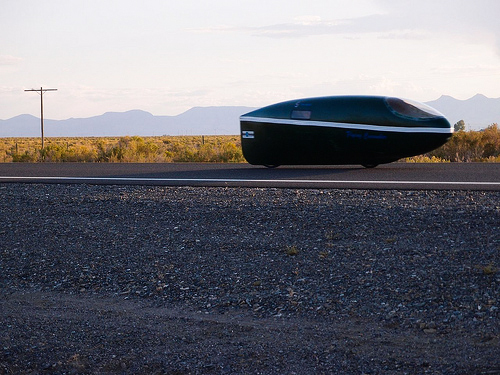 He has ridden 82 miles an hour (133kph) in a fully-enclosed recumbent velomobile. Barbara Buatois, a French woman, is not far behind at 75.7 mph (121) kph. These speeds were attained without drafting a car or any other vehicle. You can see the records and find many more photos at: http://www.recumbents.com/wisil/whpsc2012/speedchallenge.htm. They will be at it again soon, from September 10 to 15th, 20112. 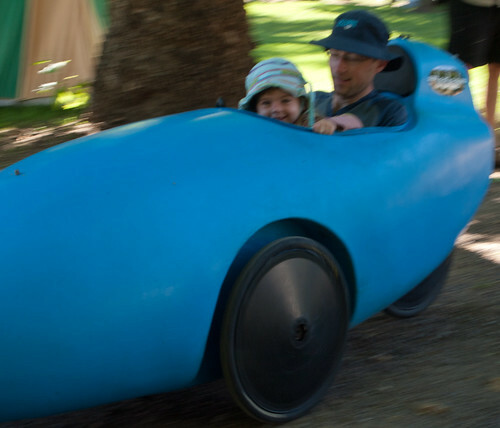 Australia will have its own contingent this year, two racers led by Ben Goodall, a Victorian based recumbent builder/racer, the man behind the plastic, kayak-inspired velomobile, the Rotovelo featured in my first photo, the blue one with father and child. The vehicles built to break these records bear little resemblance to what you see in the Tour de France, but they share most of the same parts. They need a push start because the gearing is so high, but they are, essentially, bicycles. The French banned recumbents from the racing world back in 1932, so they are now called “human powered vehicles” instead. As we were leaving Myrtleford, my car-pool companion asked me if I wanted to make a slight detour to see a dredge on the way home. Alan has been good to me over the years, so how could I resist? He had been hired some time ago to calculate the value of the huge contraption for a Parks Victoria bid. 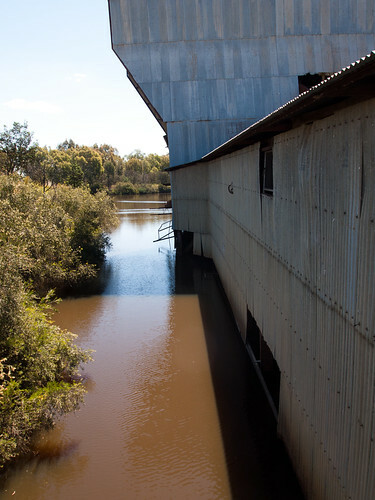 As soon as the Parks people expressed an interest, the owners said it was still valuable and that they might restore and ship it to Queensland for a tin mining operation. The consultants that Alan worked for were bought in to assess the practicality of this idea, and the value of the dredge. They determined that dismantling the beast and shipping it would cost more than the $10 million of a new, more efficient dredge. Then the dickering began. The dredge is a combination building, boat and factory. 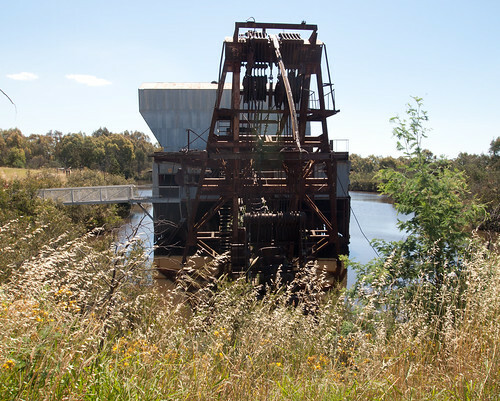 From 1936 to 1954, it slowly moved its own pond up the creek valleys, digging 70,664 ounces (2000 kilos) of gold and 1,383 tons of tin from the alluvial plain of Reedy Creek. With its endless belt of 110 giant buckets on a moveable arm, it was a slow-going chainsaw, slicing open the earth under its gigantic jaws. The buckets were made of cast chrome steel with manganese digging tips. Each one weighed over one and a half tons. It was driven by a 6,600 volt cable that ran across the pond on floats. It was a monster, the very antithesis of a recumbent bike. 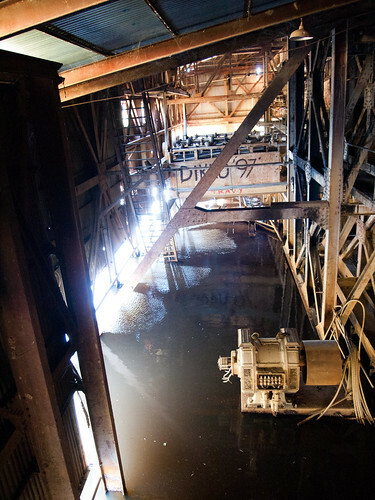 During the eighteen years of its working life, the dredge operated all day and all night, send shockwaves of sound and light out over the placid outback. It is peaceful now, abandoned to the elements, way off the beaten track. It was a worthy detour to wrap up a weekend full of odd machines. The ingenuity of man applied to tearing up the earth, or setting world speed records in lightweight, self-propelled rockets. If T.S. Eliot had lived down here with the rest of us, he would have written: “April is the cruelest month, breeding dung beetles out of dead numbers.” But Eliot had moved to England, where intellectuals don’t deal with such mundane issues as income taxes. Taxes always send me into a funk. I find the language baffling and the work paralyzing. Tax prep triggers procrastination of the highest order, and procrastination simply prolongs the pain. March is actually the worst month. In March you must assemble the numbers that will go off to the accountant to be fleshed into a dead tree of a document that will go to the IRS. Unless you live in Australia, of course. Australians do most everything at odds with the rest of the world, including creating their own tax year– June 30 – July 1. Taxes are due at the end of October. Despite the taboo against bringing foreign pests into Australia, I managed to get a nasty one past the sniffer dog. It was a cold virus, and it seemed determined to hang on as long as possible. I was into my second round of antibiotics when it struck me that this was never going away. I simply had to get out of the house and stop letting it have the upper hand. For a couple of weeks, I had been considering an invitation to join a group of cyclists intent on doing the High Country and Myrtleford Trails. Tempted but not committed, I booked a couple of cottages. I would wait until the last minute to see if I would be well enough to do it. My wife was not encouraging. VICHPV rides are not fast, but they can be long and taxing. I finally decided that if my body wasn’t ready, I could always hang out in the caravan park and read a book, swim or something. At least it would be a change of scene. The idea was to ride most of the length of two rail trails, both located in Victoria pretty much due north of Melbourne. The High Country Trail begins 300 kms from here in the town of Wondonga (on the border with New South Wales along the Murray River). Its sister town across the river in NSW is called Albury. The trail traverses farmland and forest and skirts a man-made lake called Lake Hume. It is supposed to end at the town of Old Tallangatta, about 55 kms away. There is the minor issue of a missing bridge. Robert W. has been organizing rides for VICHPV (Victoria human powered vehicles– recumbent two wheelers and trikes) for awhile now. He has recently taken on organizing some over 50’s rides for Bicycle Victoria. For the week away, he extended an open invitation to both groups. The Labour Day holiday provided for a long weekend, at least. A group of seven assembled in Wodonga in the caravan park at the civilized hour of 10 AM, then rode several kilometers across town. It would prove to be a long day. A short section through the woods was lovely, but later, the trail deteriorated into something approaching a landslide. We saw no one else on the trail and it was not hard to figure out why. It was barely suitable for mountain bikes. On a 60 km ride in the hot sun, riding on scree is not fun. We came back along the highway. Fortunately for the group, there was a good place to dine within walking distance of the Caravan Park. With a little imagination, you can fool yourself into believing that you have worked off enough calories to eat just about anything. The wine and beer nudged our tongues loose, and our evenings at the restaurant got longer and longer. The next day another couple of riders joined the group. This time we drove to our starting point, just the other side of Sandy Creek. Our destination was Old Talangatta, a town that had been partially dismantled and moved in order to flood the valley. We biked across a bridge that is was still in place and there was water below in the Mitta River, but with the drought, Lake Hume itself is receding, almost disappearing. A highlight stop on the return to Wodonga was a visit to Bonegilla Migrant Camp, Block 19, a heritage site. Over 300,000 European migrants passed through this place between 1947 and 1971. Conditions were pretty primitive, according to John, a Dutch-born volunteer guide who told us about his family’s stay in the camp. Fortunately, his father knew how to milk cows, so the family was able to move after only six weeks in the camp. They had mutton for breakfast, lunch and dinner. No heat in winter and no fans in summer. In the sixties, some Italian migrants got so frustrated they tried to burn down the place. On Labour Day, the over 50’s couples returned to Melbourne to work. The rest of us drove to Myrtleford, our home base for the Murray to the Mountains trail. It is the best known (and maintained) rail trail in Victoria. Most of its surface is covered with bitumen (pavement) and it rolls through some lovely country. Michael had already suffered so many flats on the other trail that he had replaced both tires with Armadillos, tires that looked virtually impervious to punctures. In the morning, Roger and I discovered flats before we started riding. After fixing mine, I discovered that I had bunged up my derailleur. This required a trip to the bike shop. Fortunately, it was across the street from a very good, Italian coffee shop. Almost as soon as got underway again, I picked up a thorn in the same tire. I didn’t want to change it, so I nursed the slow leak by pumping up my rear tire every twenty minutes or so. Right before our destination, Michael got two more punctures in his Armadillos. It was another long day. The evening made up for it with socializing, beer, wine and food. During the Warm many Italian prisoners of war were off-loaded in Mytleford as there was a P.O.W. camp nearby. They were used as forced farm labour. After the war, some came back into the area as immigrants and brought their families. They started farms, wineries and other businesses in the area. Our last day was dedicated to a short,gradual uphill ride from Everton to Beechworth. I had done this before with my wife on the tandem. Despite the fact that it is all uphill (in one direction, anyway) it is one of my favourite rides. Much of it through woods. It was spitting rain when we got to the top. Curiously, we were met by one of our regular trike riders, who had come from Melbourne the previous night and ridden the trail before we were done eating breakfast. It was a short, wet ride downhill to Everton and a long drive home. And a good week. Thanks to Robert and Jana, Roger and Michael, the rest of my fellow cyclists, two bike shops and my trusty recumbent. The cold is gone. Miracolo. My recipe for getting rid of a bad bug and bronchitis– take a week off, go cycling under a blistering sun between the hours of 10 and 4 PM. Use plenty of sunscreen. Eat large amounts of fried food for dinner and wash it down with lots of beer, wine, or both. Let me know how it goes. Check back in a week or so for a post about the trains that led to these trails. I got the bicycling bug after a week-long trip with my son in California. We rode from San Francisco to Mendocino, camping along the way. Until I got the hang of riding very, very slowly, I would often have to stop and push my bike up the longer hills. He wasn’t at all sure I was going to make it. At the campsites we ran into many long-distance riders, people who had ridden across the U.S. or Canada. A few were planning rides all the way to South America. We took an entire week to ride the 150 miles, so it wasn’t a quick trip, but it was invigorating to be under pedal power, spinning slowly enough to appreciate the spectacular scenery and able to enjoy the benefit of churning up calories. Then I succumbed to the siren song of recumbent bikes. We invested in a tandem so my wife could accompany me. Shortly before moving here I bought a single. Now, I’ve found a pack of recumbent and trike riders, many who have built their own bikes (see the post on cycle recyclers.) Someone in the group usually organizes a “spontaneous” Sunday ride. For my regular exercise fix, I’m dependent on the Moonee Creek Bike Path. It is not one of the most attractive paths in Melbourne. The first part of it looks very much like a shrunken version of the Los Angeles River. And there is graffiti, lots of it. For reasons I have yet to determine, Melbourne and its many suburbs are addictive to people with cans of paint. But it is extremely accessible from where I live, and parts of it are beautiful. It goes north, following the meandering path of Moonee Creek. It ducks under a spectacular trestle bridge and rolls through a newly-reclaimed wetland area. A few kilometers from where I turn around is Tullamarine airport. The WestMeadows coffee shop is my usual stop, offering cappuccino and pain au chocolat. Reason enough to stretch out and enjoy the sunshine, stoke the body’s engine with sweet tasting fuel, turn the bike around and fly south, fly towards home. Much of the wealth that flowed into Melbourne and made its stately Victorian architecture possible was generated from a gold rush that began in 1851. News spread quickly around the world. Thousands of eager immigrants mounted the gangplanks of ships bound for the promised land. Mt. Alexander Road, a nugget’s throw from here, was the yellow brick road that led to the diggings of Bendigo and Ballarat. The city emptied. A third of the inhabitants left for the diggings. Prospectors would set out along Elizabeth Street on a seven-day trek, stopping for the night at a swamp forming a chain of ponds, now Queen’s Park in Moonee Ponds. The miners turned it into a tent city, with blazing campfires, horses and bullocks. There the men would swap stories and, with luck, get some sense of what their adventure into Australia might bring them. The settlement doubled in size in a year. By the time the rush was over, one hundred million British pounds worth of gold had been wrestled from the earth and shipped off to Europe. The fortunes that remained rested in the hands of merchants and businessmen. By 1861, barely twenty-five years after its founding, Melbourne was on its way to becoming a thriving city of 125,000 immigrants. 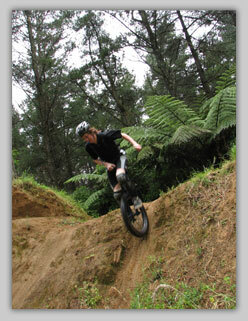 On Easter Sunday, we set off in search of gold of a different sort– the premier rails-to-trails bike path in Victoria. It is called Murray to the Mountains, a nice bit of alliteration but a bit misleading. The trail actually begins in the town of Wangaratta and ends in the town of Bright, at the base of the region called the Australian alps. The trail is paved, pastoral, and, with one singular exception, fairly flat. 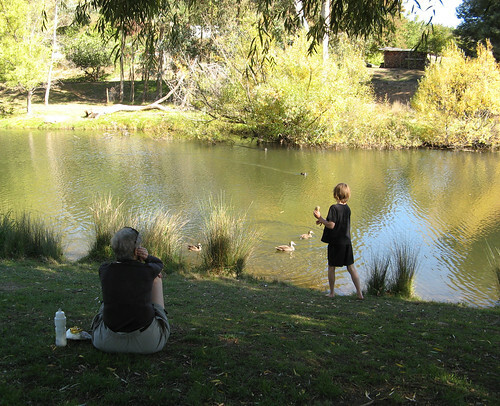 The exception is a short section that mounts from the modest community of Everton to the historic town of Beechworth. Gold was discovered in Beechworth in February, 1852. By November, it is thought there were 8000 miners camped in the area. Through the use of hydraulic sluicing and other environmentally degrading methods, approximately two billion dollars worth of gold (in current valuation) were extricated from the region during the next fourteen years. What remains seems like a ghost town. Honey-colored granite buildings haunt the streets and beckon busloads of tourists. Now, there are far more banks, churches, grand houses, hospitals, and other civic structures than necessary to handle the needs of the busy little tourist mecca Beechworth has become. Although the ride from Everton to Beechworth is only fifteen kilometres, it is almost entirely uphill. I could easily imagine the train that had threaded its way up through the wooded hills. What I had to visualize was me and my wife, astride our tandem recumbent bike, doing the same thing. “I think I can, I think I can.” We huffed and we puffed. Slowly moving the wheeled beast up the paved path. The leaves were turning, the weather was wonderful, crisp and clear. We were alone in the woods, enjoying the muscles of our legs, hearts and lungs. And now, at last, we could see the old Beechworth train station, freshly painted. We would ride into town, stretch out our legs at a cafe, soak up the sun like cats with cappuccinos. Then, when the time was right, we would turn our backs on the past, on the gold and the ghosts, and sail back down to the valley below. Melbourne is a cycling city. That was one of the many things that attracted me to moving here. 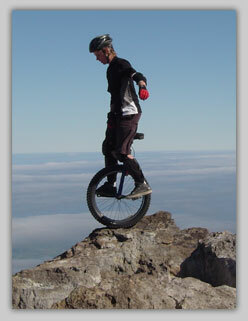 I am a born-again enthusiast of two wheel flight. About a year and a half ago, I split from the cycling church of my youth into a splinter group of of heretics–recumbent and trike riders. Why? Well, aches and pains had a lot to do with it. It made a lot of sense to me to look at the sky instead of the ground. I toyed with the idea of a trike, but I wanted to ride on roads as well as bike paths and trikes seemed to take up too much room. We bought a tandem first. I invested in my own recumbent about six months before the move. The British are tinkerers. It is hard to imagine the industrial revolution without the inventions that came out of Great Britain. In this corner of the commonwealth, one of the spin offs of that sensibility has been the creation of self-propelled machines the likes of which I have never seen before. 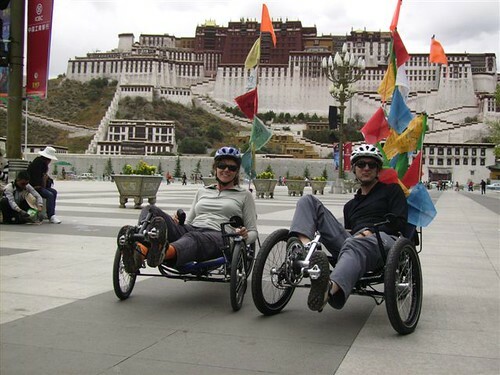 Tandems, recumbents, ingenious folding trikes. Most of the members of the group build their own two, three and four wheelers. Last night I looked down at one little grasshopper-colored bike and asked the owner where it came from. He said it was a Japanese design, made in Taiwan, but he had changed almost everything from the steering to the seat. The leader of Sunday’s spontaneous rides took one look at my bike and suggested I switch to underseat steering. He would help me, he said. No problem. They are cycle recyclers, inventive and fun. They are not the lycra set, determined to huff and puff their way to the front of the pack. They are laid back and relaxed, taking in the scenery, chatting and dreaming up new and better designs for the most efficient vehicle ever built. Maybe it is time the heretics took over the church.